امروزه شبکه حسگرهای هوشمند به عنوان یکی از روش های نوین اخذ اطلاعات، در مدیریت ترافیک مطرح است که با امکان پایش هوشمند معابر شهری منجر به کاهش سوانح جاده ای می گردد. علیرغم اهمیت نصب و استقرار چنین تجهیزاتی مهمترین دغدغه تعیین مکان بهینه جهت نصب آنهاست. بنابراین آنچه در این تحقیق هدف ماست ارائه روشی مناسب در جهت مکانیابی بهینه حسگرهای ترافیکی است، روش پیشنهادی ترکیبی از روش های فازی سلسله مراتبی و تاپسیس است. لازم به ذکرست که برای تست روش پیشنهادی در این تحقیق بخشی از شبکه معابر شهری در شمال آمریکا به عنوان داده نمونه انتخاب گردید. در مرحله بعد با نظر کارشناسان ترافیک معیارهای تعیین مکان بهینه انتخاب گردید که در این تحقیق عبارت بودند از ترافیک متوسط سالیانه، شدت تصادفات، شیب متوسط و فاصله هر اتصال در شبکه شهری تا مکان های نیازمند کنترل ترافیک.برای مشخص کردن میزان اهمیت معیارهای ورودی از روش سلسله مراتبی فازی استفاده گردید، این روش با استفاده از اعداد فازی در مقایسه زوجی معیارها برای محاسبه وزن آنها، منجر به افزایش دقت محاسبات می گردد. در مرحله بعد وزن های محاسبه شده با استفاده از روش تاپسیس به رتبه بندی اتصالات شهری در محدوده مورد مطالعه پرداخت. در نهایت بعد از اجرای تحلیل مذکور با استفاده از نمره حاصل از روش تاپسیس اتصالات شهری در منطقه مورد مطالعه به سه کلاس متفاوت طبقه بندی شدند. اتصالات شهری قرار گرفته در کلاس اول به عنوان اتصالات شهری با بیشترین اولویت برای نصب حسگرها انتخاب شدند. بنابراین اتصالات مذکور در بیشترین اولویت برای نصب حسگرهای ترافیکی خواهند بود. Nowadays Smart traffic sensor network is considered as one of the newest ways of data acquisition in traffic management which with the possibility of intelligent monitoring of urban roads, leads to road accident reduction. Despite the importance of installing and deployment of such equipment, the most important concern is to determine the optimal location for their installations. Therefore, what we are aiming at in this research, is to provide a suitable method to optimize the location of traffic sensors. The proposed method is a combination of FUZZY AHP and TOPSIS method. It should be noted that, in order to test the proposed method in this study, part of the urban road network in North America was selected as sample data. In the next step, according to traffic experts, the criteria for determining the optimal location were selected which included average annual traffic, crash severity, average slope and the distance of each connection in the urban network to places requiring traffic control. The FUZZY hierarchy method was used to determine the significance of input criteria. This method using FUZZY numbers in a pairwise comparison of criteria to calculate their weights, leads to an increase in the accuracy of computations. In the next stage, the weights calculated using TOPSIS method were used to rank the urban connections in the study area. Eventually, after applying the above analysis using the score obtained from TOPSIS method, urban connections in the study area were classified in 3 different categories. Urban connections in the 1st category were selected as the ones with the highest priority for the installation of sensors. Therefore, these connections will be the top priority for the installation of traffic sensors. 1- Argany,M., Mostafavi,F.,Karimipour,F.and Gagné,C (2011), ”A GIS Based Wireless Sensor Network Coverage Estimation and Optimization: A Voronoi Approach”, Springer, Berlin,pp.1-22. 2- Boand,Q., Ruan, D.,Yongjum,S. and Hermans,S. (2010) “Creating composite road risk performance index by hierarchical Fuzzy-TOPSIS approach”,IEEE, Belgium,pp.1-6. 3- Habibian,M.,Mesbah,M. and Sobhani,A (2011) “Ranking of hazardous road locations in two-Lane two-way rural Roads with No Crash Record”,Australasian Transport research forum,Adelaide,pp.1-11. 4- Jantakat, Y.,Sarapirome,S.,Ongsomwang,S. and Littidej, P (2007) “Research paper”, Institute of Science, Suranaree University of Technology, Thailand,pp.1-7. 5- Liwe,H., Pei,Y., Qiuz,Z. and Liu,Z(2009) “Evaluation of Road Traffic Risk Based Improved Fuzzy-AHP Method”,ASCE conference,USA,pp.1-4. 6- Maozeng,X. and Yang,D (2009) “Risk assessment of ordinary goods transportation on road segments based on AHP and COWA fuzzy decision method”,IEEE, Fuzzy Systems and Knowledge Discovery (FSKD), Eighth International Conference, Shanghai,pp.1-3. 7- Mikhailov,L. and Tsvetinov,P (2003)”Evaluation of services using a fuzzy analytic hierarchy process”, Journal of Applied Soft Computing, Elsevier , Vol.5, pp.23–33. 8- Moghar,A. and Mohammad Reza Fathi (2012) “A Combined VIKOR – Fuzzy AHP Approach to Marketing Strategy Selection”, The journal of Business Management and Strategy,Vol. 3, No. 1, pp.13-27. 9- Rokhsari, S., Delavar, M., Sadeghi-Niaraki, A. and Moshiri, B. (2012) Optimum Site Selection of Urban Traffic Cameras Based on AHP, Voronoi Diagram and Image Fusion Concept,Itac conference,Iran. 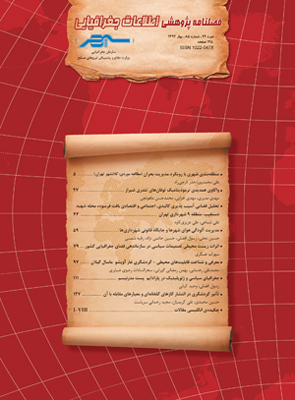 10- Sadeghi-Niaraki,A.,Varshosaz,M. and Behroz, H (2003) “Implementation of the resulting cost model of the roads network in the geographic information system”,ISPRS,Australia,pp.1-4. 11- Saghafian,S. and Hejazi,R (2005)”Multi-criteria Group Decision Making Using A Modified Fuzzy TOPSIS Procedure”, International Conference on Computational Intelligence for Modelling, Control and Automation, IEEE,Iran,pp.1-5. 12- Shirzadi Babakan, A., Delavar, M. R., Taleai, M. and Karimi, F (2000)”Space allocation of emergency centers using Voronoi diagrams”,ISPRS conference ,Austalia,pp.1-4. 13- Zhang,F. and Qingyuan , A.Q (2000)”Improve on Dijkstra shortest path algorithm huge data, ISPRS coference”,China,pp.1-4. 14- Zhou, J., Cheng,L. and Shi,J (2010) “Traffic risk evaluation by using a comprehensive method based on Delphi-Fuzzy-AHP”,ASCE,USA,pp.1-5.